Successful designers go beyond vague notions of “user friendliness,” doing more than simply making checklists of subjective guidelines. They have a thorough understanding of the diverse community of users and the tasks that must be accomplished. They study evidence-based guidelines and pursue the research literature when necessary. Great designers are deeply committed to serving the users, which strengthens their resolve when they face difficult choices, time pressures, and tight budgets. Everyone involved in the development of products and systems that require interaction between people and computers should approach their work with an understanding of user interface design. Even if you’re a programmer who writes code based on specifications that are written by others, you should still know how to develop a system that will really work for humans. At a list price of $95 ($76 from Amazon.com), this book isn’t cheap, but its 672 pages of practical guidance makes it worth every penny. 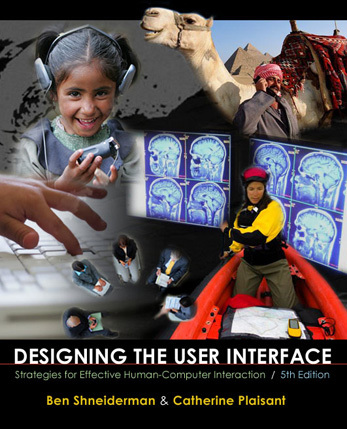 Does anyone else find it ironic that the “user interface” of the book cover is not very pleasant? That’s one nasty hodgepodge of stock photography. I agree that the cover doesn’t represent the fine contents and principles of the book. It is quite possible that Addison-Wesley didn’t give Ben and Catherine any say in the matter. When I worked with O’Reilly Media to publish my book Information Dashboard Design, I worked long and hard to negotiate a contract that gave me the right of approval over all aspects of the book’s design, including the cover. During the production process, I rejected all of the graphic design team’s proposed covers and ended up designing it myself with their assistance to polish it up a bit. I’ve seen too many examples of an author’s fine work undermined by a publisher’s short-sighted decisions, often made to cut costs, such as printing a book about information visualization in black and white rather that full color. To their credit, O’Reilly Media understood my concerns and was willing to allow a contract that supported them. Many publishers will not. This seems to be a really unfortunate trend in many of the academic books in this field. Another good example is “Readings in Information Visualization: Using Vision to Think (Interactive Technologies)” by Stuart K. Card, Jock Mackinlay and Ben Shneiderman. Great content, but horrendous presentation! With the availability of cheap high-quality print on demand (e.g. lulu.com), it’s time for visualisation academics to fight for high quality full-colour books.